Many drivers admit THEY engage in the behaviors they find unacceptable in others. It’s Drive Safely Work Week. How’s your driving? 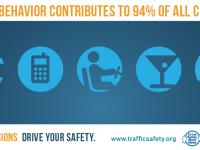 Driver behavior contributes to 94% of all crashes. YOUR DECISIONS DRIVE YOUR SAFETY.